THE ANNUAL REPORT IS THE PRIMARY SOURCE FOR KEEPING OUR MAILING LIST ACCURATE AND FOR SELECTING VARIOUS NATIONAL AWARDS. Please complete and submit the form at the link below by MONDAY, 10 JUNE 2019. Late submissions are accepted, but not eligible for national awards in 2019. 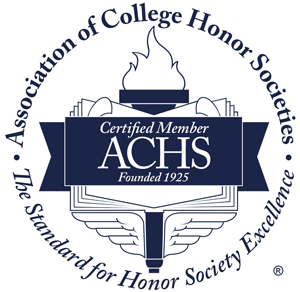 Honor Chapters will be designated on the basis of activities completed in the 2018-2019 academic year with particular attention to the relevance of chapter projects to Sigma Delta Pi’s mission, the quality of chapter projects, the number of chapter projects in relation to the chapter’s size, evidence of direct involvement of student chapter officers, and supporting material. On one separate MS Word document or in PDF format, please describe in detail your chapter activities. This narrative must clearly indicate which activities were 1) initiated and carried out by chapter members, 2) executed in cooperation with another organization, 3) sponsored by another organization but with attendance and/or participation by chapter members. ALL RELEVANT SUPPORTING MATERIALS (e.g., event flyers, pictures, etc.) must be included within the aforementioned MS Word or PDF document and uploaded when completing the report form or e-mailed as one consolidated attachment separately from this online submission to sdpnational@gmail.com. Files larger than 1 MB should be shared with sdpnational@gmail.com via Google Docs (https://docs.google.com) or Dropbox (http://www.dropbox.com). For model Honor Chapter Submissions, see Florida Atlantic University and Montclair State University. Additional information is available on our How to Become an Honor Chapter page.